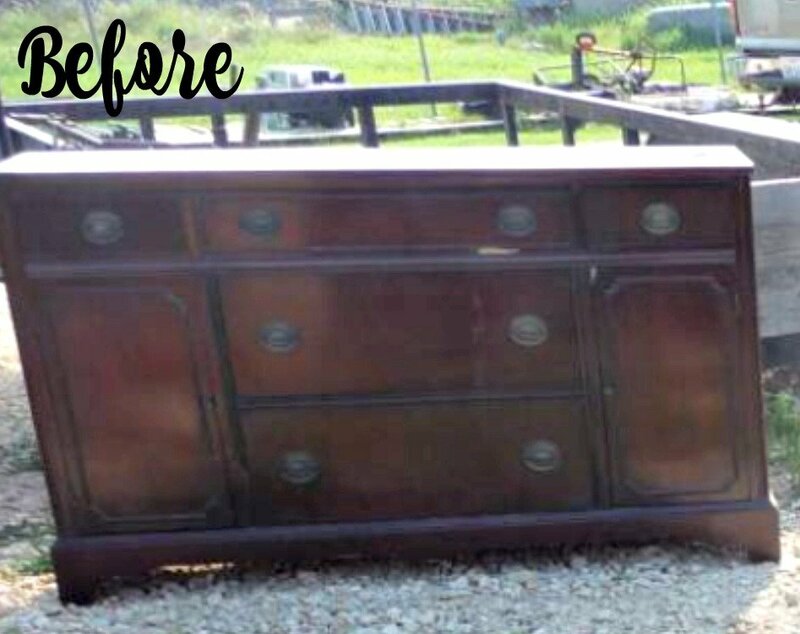 A drastic difference to the dark piece of furniture before! It was sad…but it really wasn’t “crooked”…LOL! I honestly have no idea why this photo loaded like this…but it makes the after look even better! It is crooked right? I’ve not had too much wine?? This entire painted buffet has been glazed with Dixie Belle Grunge Glaze AND distressed quite heavily. Let me tell you….. underneath that aged glaze is a WHOLE lotta color! 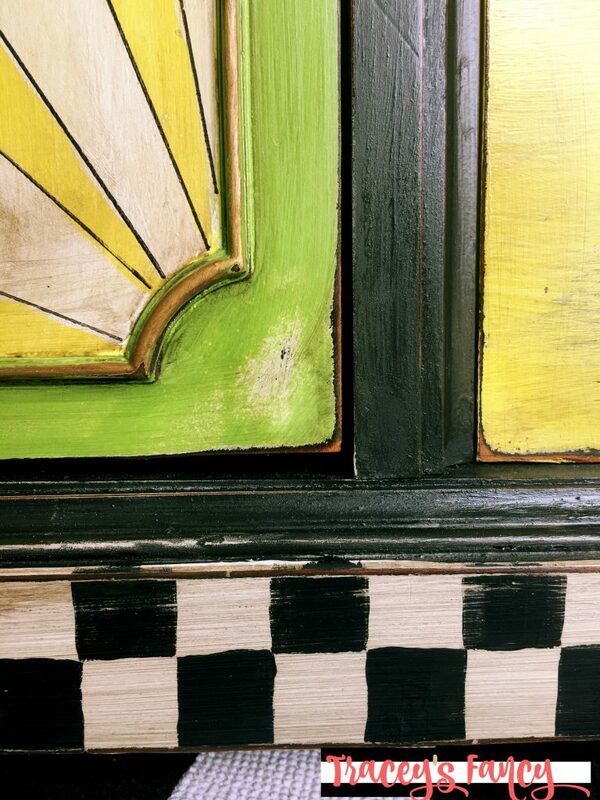 The top harlequin pattern was done with…. The tiny dots were made with Caviar and a tiny bit of “paint crack”….. 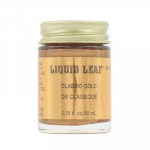 Liquid Leaf Gold . 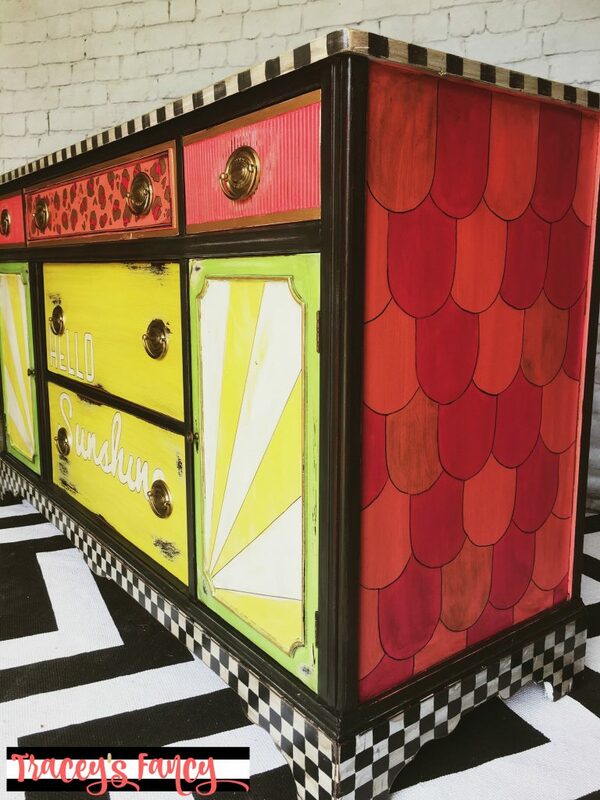 The front of the painted buffet is coated in this gorgeous sunny yellow….also known as Daisy. 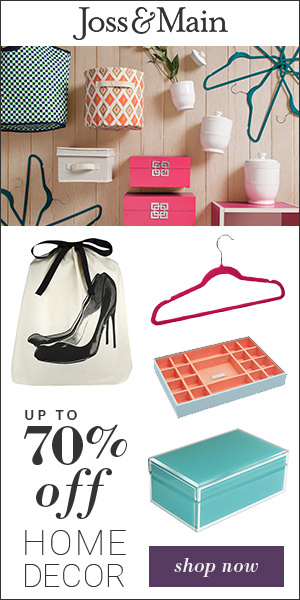 The top drawers are painted in my absolute favorite name of the four that she offers in her store….Flamingo!!!! LOL! Now let’s gaze toward this side panel…..the photo above does not capture the brilliance of the colors…but this photo below is spot on! 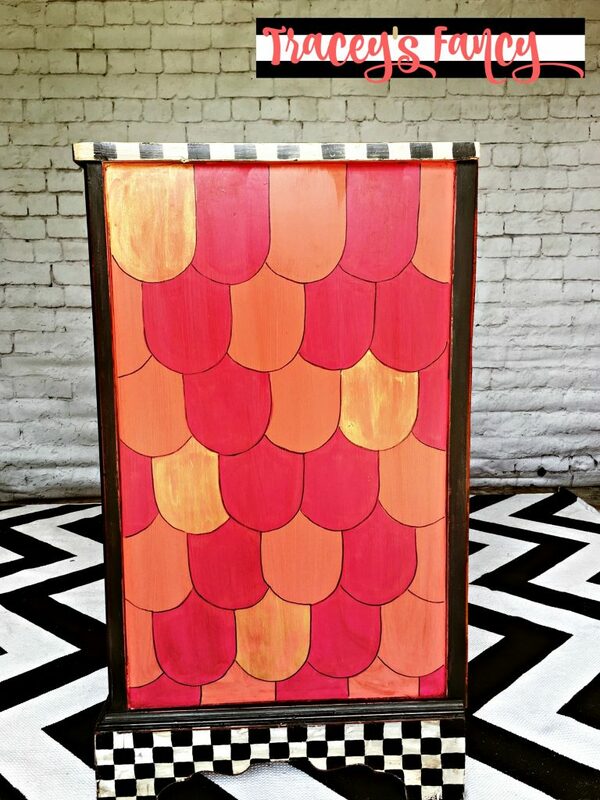 I chose to layer mermaid scales….because we all know I love mermaids…and they are beachy….and two of my famous mermaid chairs are going to this boutique too….and because I did a wall art in tin foil painted mermaid scales earlier this year and always wanted to do it on furniture…so why not now?!?! I used Flamingo, Peony and Liquid Leaf Gold. Just check out how that gold shimmers even THROUGH the Grunge Glaze! I’m super pleased with the outcome of the side panels. Here is an up-close look at the layered-yummy-distressed-glazed-goodness going on! I really love this photo! Nothing about it is perfect! There are brushstrokes…uneven lines….drips and smears…but it is still eye candy for me! And can we talk about this checkerboard? Look at it! Is it perfect? NO! Not in the least! I did this completely freehand after drawing off my lines with a pencil and a ruler. And then I just start filling in the squares. I LOVE how long it takes me! I really do! There is something about having to force patience and concentration on myself for long periods of time that just makes me feel like a champ when I’m done!!! I almost always use Caviar and Drop Cloth for my black and white patterns…both of which are by Dixie Belle Paint Company. Watch my video in this previous post for my dirty little secret for painting black and white patterns, and even harlequins. I sealed the entire piece in Clear Coat in Gloss. 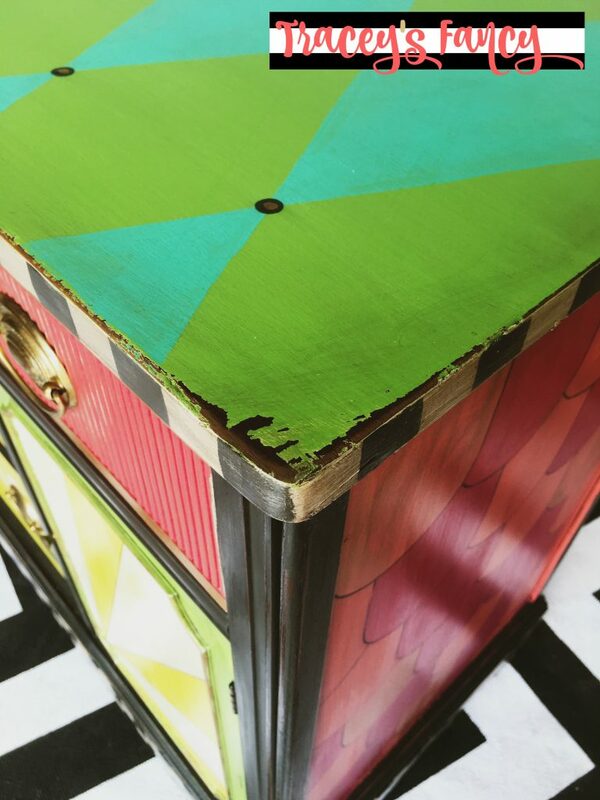 Lately…I’ve been on a “bright color highly distressed glossy finish” look….and I really really like it! I want to distress and high gloss everything! And maybe I also want to put metallic gold on everything…and maybe leopard! Or maybe even paint metallic gold leopard on the drawer front of this painted buffet! Thank goodness Salty Dog Gallery is already full of color! This piece had no choice but to be bold and bright and crazy in order to hold its own in sunny Florida! Say Hello Sunshine one more time….because FALL is setting in! Thank you Carla (Salty Dog owner) for giving me full freedom to do as I pleased with this piece….and for opening your store to my funky style! Thank you Dixie Belle Paint Company for making such a fabulous product that I can’t stop sharing it with everyone weekly!!!! AND most of all…..thank YOU for being here….in my space…in my blog land….and supporting my art….no matter how crazy I get with it! 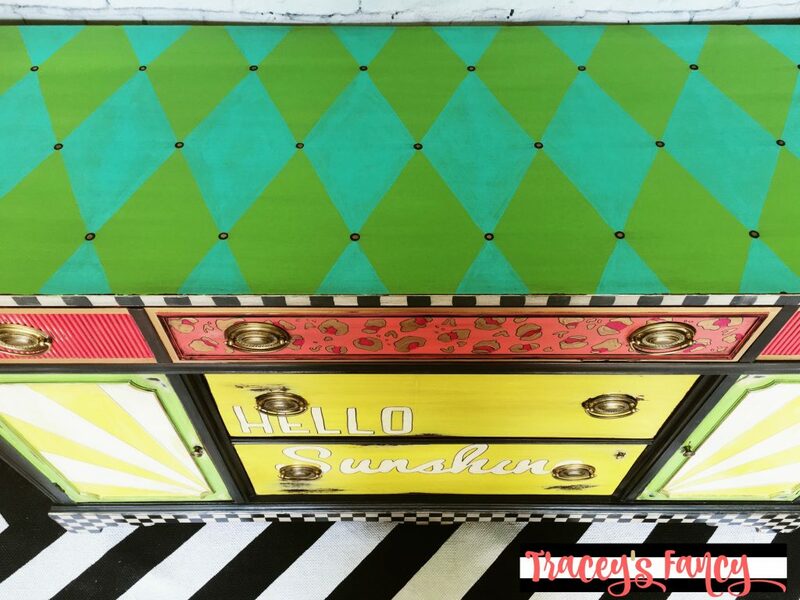 Love this sunny color combo on my painted buffet? Check them all to here! Dixie Belle Paint company offers amazing products that will make all of your projects successful no matter what your skill level! You can also my favorite products and tools in my Amazon influencer list here. And while you’re still with me, subscribe to my blog for weekly, colorful furniture inspiration! 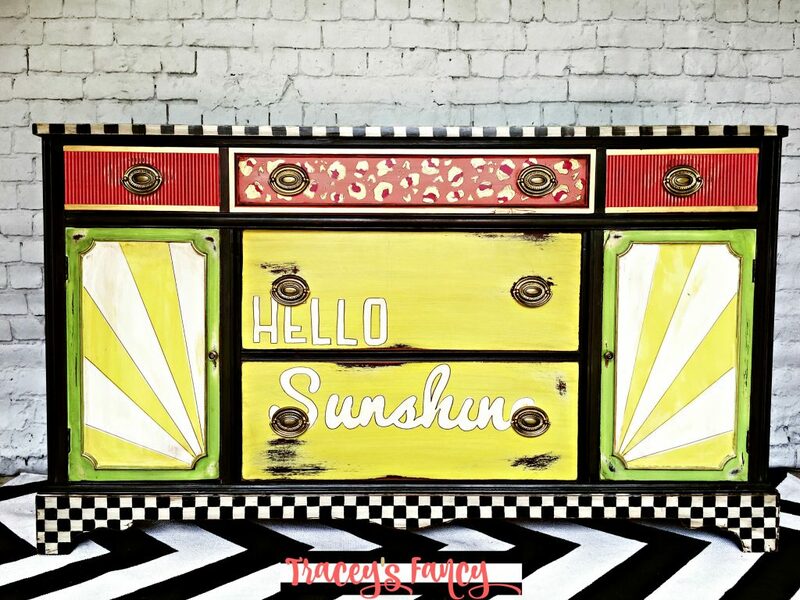 Please pin my Hello Sunshine painted buffet for your Pinterest followers to see and follow me too! I LOVE this gorgeous culmination of unexpected colors and patterns. You’re creative mind works in genius ways. I’d live to see all of your pieces together at the Salty Dog. Hope they share it with us! Thank you so much Nicole…..for reading….recognizing….and for commenting! Your words speak to me and your creative opinion matters! I am wrapping up my Salty Dog pieces tomorrow and I’m kinda sad. I’ve really enjoyed working with Carla Pine! I have to echo Nicole: this is genius. Never stop allowing your heart and soul to guide that brush, Tracey! The combination of Leopard, Harlequin, Mermaid Scales and oh-so-bright signature colors is breathtaking. Your design work is beyond compare, my friend. Adore. Thank you Heather! Thank you for recognizing my heart in my work. That means so much to hear!! I somehow missed my comments on my blog this week! I apologize for the delay in responding. Looking at this comment makes me happy Lisa! Thank you so much for sharing that with me! !